Equally known for its tree-lined streets and intimate atmosphere as it is for its thriving culinary and nightlife scene, the West Village is unarguably one of the most desirable places to live in Manhattan. 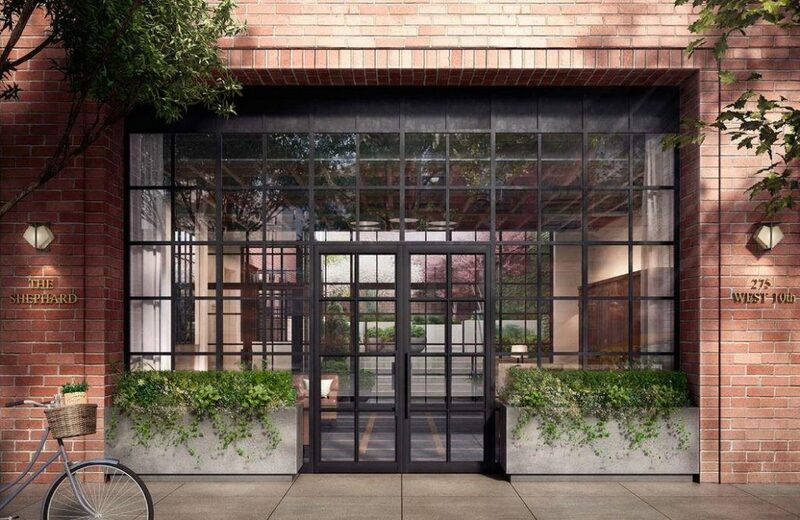 Naftali Group‘s The Shephard at 275 West 10th Street fits in perfectly with the historic allure of the neighborhood. That’s due to a combination of wisely maintaining the building’s original iconic facade and updating the building with industry-leading amenities and design. Within the 38-unit, 18-story building, there are eight units listed, ranging from $4.35 million for a spacious 7th floor two-bedroom and two-bathroom suite with study to $11.5 million for a palatial 3,800 square foot four-bedroom, four-bathroom suite with wet bar and den. Two maisonettes are also listed, one with a charming garden terrace. Both have traditional foyers, private entrances, interiors designed by Gachot Studios and architecture by Beyer Blinder Belle. Every room at The Shephard has been crafted to be grand, but livable. Living rooms are spacious with unique vaulted ceilings and 3/4″ solid oak floors in a classic herringbone pattern. Windows maintain their romanticism through keeping the original facade, but new custom windows with UV protected glass allow maximum light to flow through the rooms. Kitchens feature solid soft grey Italian mahogany cabinetry, Statuary white marble countertops mixed with honed black granite work surfaces, custom Valli & Valli hardware and brass and satin nickel accents. All appliances are Miele, the gold standard for appliances in luxury condominiums. The bathrooms are just as impressive with white marble flooring in mosaic fan tile. Heated floors, mahogany vanities, and Bianco Dolomiti marble slabs in the master bathrooms create an elegant feel. Meanwhile, the Carrara marble and countertop slab, black Nero Manquina hex tile floors, satin nickel fixtures and brass details in the secondary bathrooms look and feel just as luxurious. 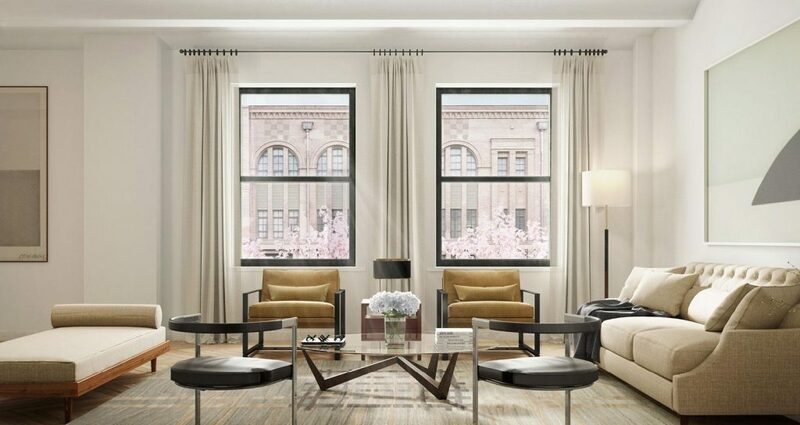 The Shephard’s views are also some of the most desirable in the West Village. Lower floors enjoy classic tree-lined street and garden views, and upper floors have extraordinary city exposures, as well as Hudson River, Statue of Liberty, and Empire State Building views. 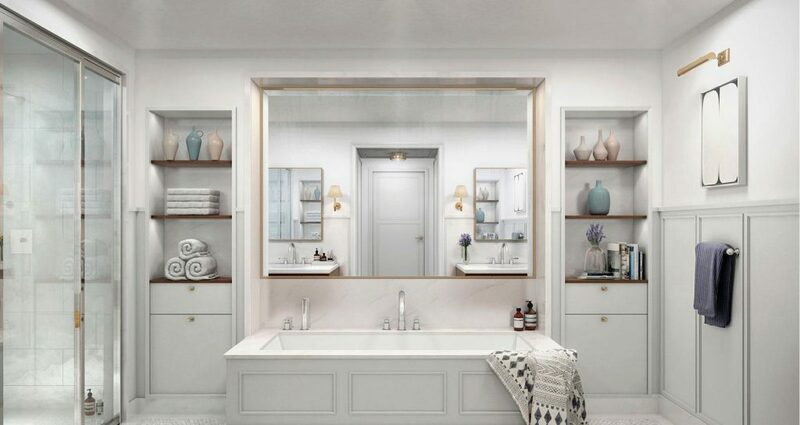 Naftali Group also launched its new collection of homes on West 77th Street in the Upper West Side this September. Designed by Thomas Juul-Hansen and Goldstein Hill & West Architects, 221 West 77 is under construction now. Visit 275w10.com for more information.